Anti-piracy unit Group-IB Anti-Piracy prepared Report with the analysis of the Russian pirated video market. In this area, Russians have much to be proud of. Apparently, in 2018 will be set a new record in the number of views of "pirate". Experts calculated that the number of requests in popular search engines for "watching movies and serials for free" was almost 10 billion. Thus, based on the total audience of runet ~ 90 million people, on average each user has about 3-3339. 110 views [/b] pirated copies of films. This is approximately 1 film or episode of the series in 2-3 days. The Group-IB subdivision stated that last year the pirate market was grew by 21% to $ 85 million . So many criminals who lay out films for free viewing on the Internet earn so much. Group-IB Anti-Piracy serves the interests of rightholders. In their advertising it is written that the system monitors more than ??? 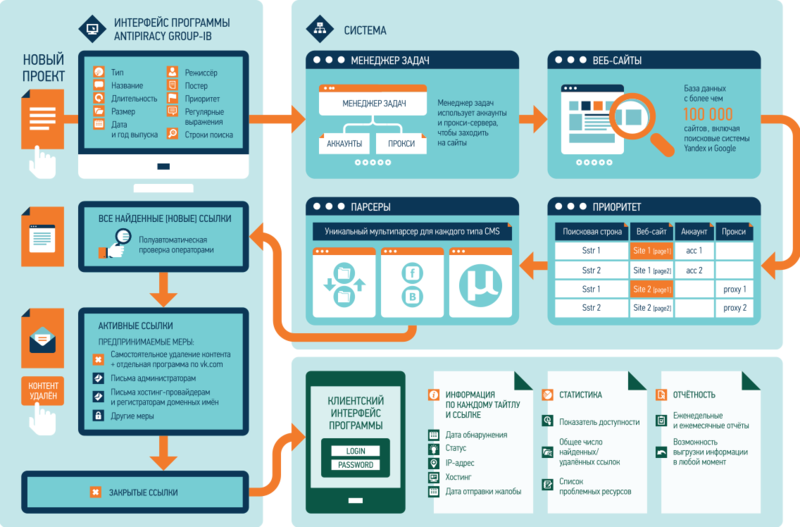 resources in Russian and English languages ​​- from torrents and streaming services to groups in social networks and pirate sites in darknet. Having concluded a contract for "sweeping the Internet", the company establishes the ultimate owners of resources - and communicates directly with them. The system uses digital fingerprinting technology, which "allows you to compare digital copies over a whole set of parameters and detect pirated content, even undergoing significant changes." The customer is provided with a web interface with visual statistics for each title (monitoring of the results of stripping and monitoring of search results). Group-IB also provides other services, including "the perfect collection of evidence to appeal to the court" and "professional legal support of the claim." The firm already has a successful experience of judicial blocking of pirate sites. For the "Internet stripping" service, you can order free testing. years are distributed through torrent trackers in different versions of quality, and the number of downloads is hundreds of thousands. Only registered users can participate in the survey. Enter , you are welcome. How much did you spend on purchasing movies and TV shows in 2018? Voted out 805 users. Abstained 116 users. 14/09/2018 Who is the monopoly of pirated video content? 06/09/2018 "Yandex" received new claims from the TV channels "Gazprom-Media"